The weather outside may be frightful in some parts of the country, but here in Fairfield and Northern California, the sun has been shinning bright (most of the time, at least) for weeks. Our region is one of those lucky places in the world that offer mild winter temperatures, allowing the opportunity for everyone to enjoy outdoor activities even on the coldest days. And what better way to experience the outdoors in Fairfield and Solano County than by participating in one of Solano Land Trust's many activities? Solano Land Trust strives to permanently protect natural areas, working farms, and ranchlands in Solano County, while also connecting the community to these lands. Their five anchor properties include three in Fairfield and Suisun - Lynch Canyon, Rush Ranch and Rockville Trails. These lands represent the rich and varied landscape that makes Solano County unique. From rare vernal pools to tidal marsh wetlands to rolling serpentine grasslands, the properties serve an important role in preserving these habitats for residents in the local community, the Greater Bay Area and all of California. Below you'll find fun activities for you, your friends, and your family. These include free guided hikes and volunteer opportunities every month, as well as special events like the annual kite festival, trail run, sporting clay shoot, feast & art auction and more. No RSVP necessary, unless otherwise stated. Sat, Jan 17, 2015: Get the Rush at Rush Ranch, 10 a.m. to 1 p.m.
Get the Rush is a series of fun activities for the whole family, offered on the third Saturday of every month at Rush Ranch. WHAT TO BE PREPARED FOR: All ages and mobility levels are welcome! This event is 100% volunteer-run. Timing and activities vary month-to-month based on volunteer availability and the weather. November through March: The blacksmith shop remains open for visitors! The wagons are in storage for the winter. Other activities are dependent on volunteer availability and the weather. WHAT TO BRING: Water, snacks or picnic lunch, bug repellent. Be prepared for variable weather by bringing layered clothes, sturdy closed-toe shoes, and protection from the elements (sun, wind, fog, rain). Optional: binoculars, camera. REGISTRATION: None. Just show up! Monday, Jan. 19, 2015: Holiday Hike at Rockville Trails Preserve, 9 a.m. to 1 p.m. Enjoy the holiday with a hike through the hills between Green Valley and Suisun Valley. Enjoy great views of oak woodlands while getting in shape! This guided power hike is led by docents Cathy and Richard Christo. WHAT TO BE PREPARED FOR: (1) Arrive on time and be prepared to immediately carpool from the meeting place (see below) to the trailhead. (2) Participants of all ages are welcome, but they must be prepared for the following: An intermediate to strenuous pace hiking 4 to 6 miles up and down rugged, steep, and slippery hills that are full of sticky seeds and thorny plants. Some travel may be off-trail. (3) The preserve is a working ranch where free-range cattle roam as they please. (4) Visitors must be accompanied by a docent at all times. (5) Since the preserve is otherwise closed, the entry and exit gate will be locked except for the start and end times of the hike. (6) There is no drinking water. (7) There are no bathrooms. (8) In order to protect wildlife, cattle, and rare plants--and for your pet's safety--dogs are not allowed. (9) Take only pictures, leave only footprints. (10) Maintain a safe distance from cattle and wildlife, and be aware that this is tick, rattlesnake, mountain lion, and wild pig country. WHAT TO BRING: (1) A backpack with plenty of water and snacks. (2) Hiking boots or sturdy closed-toe shoes with good grip. (3) Long, sturdy pants are recommended, along with layered clothes, and protection from the elements (sun, wind, fog, rain). (4) You may also want to bring gaiters (to protect your legs from thorny plants), hiking sticks, bug repellent, binoculars and a camera. MEETING PLACE: Since there is no parking lot at Rockville Trails Preserve, please meet your guide promptly and be ready to leave immediately from the big red "Ice House" building on Suisun Vly Ct, near the southeast corner of the Rockville Rd. and Suisun Valley Rd. intersection, behind La Barista Espresso, Fairfield, CA. Park beside the red barn. A Rockville Trails Preserve docent will be there to greet you. Be ready to carpool from there to the trailhead. WEATHER PLAN: Rain cancels. Call your guide (see below) if the weather is uncertain. REGISTRATION: Pre-registration recommended online at conta.cc/1rTOOGH. For questions, call Cathy at 707-745-1913. 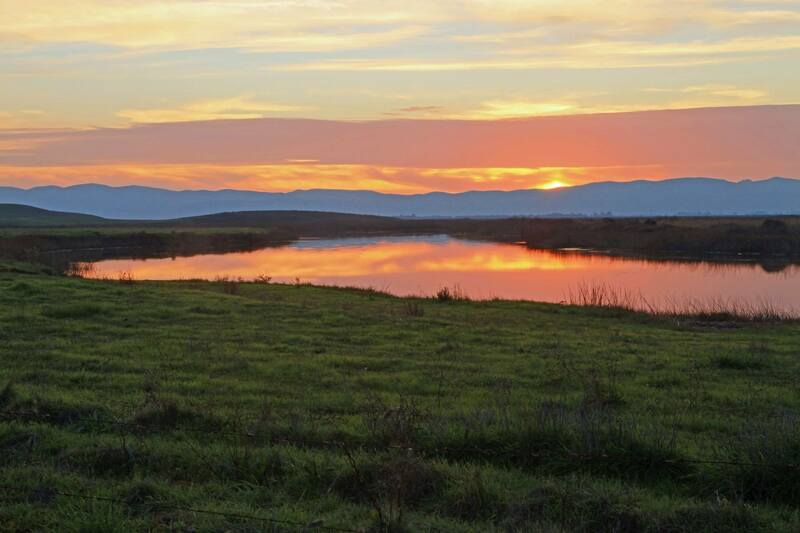 Monday, Jan. 19, 2015: FLOODED WITH SCIENCE AND SEAWATER: A GUIDED NATURE WALK ALONG THE EDGE OF SUISUN MARSH DURING THE KING TIDE, Rush Ranch, 12 p.m. to 2 p.m.
Take a pause on Martin Luther King Day to learn about science while walking on the edge of Rush Ranch’s wild wetland. Join scientist and educator Sarah Ferner from San Francisco Bay National Estuarine Research Reserve for a short walk near the edge of Suisun Marsh during one of the highest high tides of the year – a King Tide. Nature should put on a quietly beautiful show as the rising tide slowly floods the marsh. We will learn about Rush Ranch’s tidal marsh, scientific research occurring there, and what King Tides can teach us about sea level rise. WHAT TO BE PREPARED FOR: (1) This event is primarily for adults, though interested young people are welcome. (2) Please dress appropriately for winter weather, including walking on trails that will likely be wet or muddy and standing still in windy conditions. (3) In order to protect wildlife, cattle, and rare plants—and for your pet's safety—dogs are not allowed on these trails. (4) Take only pictures, leave only footprints. (5) Maintain a safe distance from cattle and wildlife, and be aware that this is tick and wild pig country. WHAT TO BRING: (1) A backpack with plenty of water and snacks. (2) Boots or sturdy closed-toe shoes with good tread. (3) Protection from the elements (sun, wind, fog, rain). (4) Layered clothes that can get wet or muddy. (5) Also recommended: Bring binoculars to get a closer view of things. Bring your camera to participate in California King Tide Initiative’s citizen science photo monitoring. MEETING PLACE: Meet at the Rush Ranch Nature Center. REGISTRATION: Space is limited and pre-registration is required online at goo.gl/Gx3ma3. Saturday, Jan. 24, 2015: BEES, BEES, BEES! WHY ARE BEES SO VITAL? HOW CAN WE ATTRACT THEM AND HELP THEM PROSPER?, Rush Ranch, 1:30 p.m. to 3:30 p.m.
Dr. Robbin Thorp, UC Davis Professor Emeritus, will make an appearance to share his extensive knowledge of California's native bees, discuss their importance as crop pollinators, and encourage participants to create habitats that foster growth of bee populations on farms and in gardens. WHAT TO BE PREPARED FOR: This is an indoor lecture that could last up to two hours. WHAT TO BRING: No need to bring anything. MEETING PLACE: Rush Ranch Nature Center. Click here for directions. WEATHER PLAN: Rain or shine. REGISTRATION: None—show up early though because space is limited. Saturday, Jan. 31, BAY AREA RIDGE TRAIL HIKE, Lynch Canyon, 9:30 a.m. to 2 p.m.
Join us at Lynch Canyon to hike a portion of the Bay Area Ridge Trail. On this hike you will challenge yourself getting up to the ridgeline and hiking a full 8+ miles but the 360 degree views from the ridgeline are worth the effort. COST: The guided hike is free! Parking is $5, or an annual parking pass can be purchased; call 707-784-6765 for details. All proceeds help Solano County Parks keep this land open and safe. WHAT TO BE PREPARED FOR: (1) Please arrive 15 minutes early to check-in and get ready. (2) Participants of all ages are welcome, but they must be prepared for the following: This hike will be approximately 8.3 miles. The route includes rugged, steep, and slippery hills that are full of sticky seeds and thorny plants. Expect rough, rocky, uneven ground. The trail will take us up to the ridgeline and we will descend a steep hill on our return. We will keep a moderate pace with plenty of breaks to catch our breath, discover the emerging plant life and search the vistas. (3) This is a working ranch where free-range cattle roam as they please. (4) There is no drinking water. (5) There is one bathroom, located in the parking lot. (6) In order to protect wildlife, cattle, and rare plants—and for your pet's safety—dogs are not allowed. (7) Take only pictures, leave only footprints. (8) Maintain a safe distance from cattle and wildlife, and be aware that this is tick, mountain lion, and potentially rattlesnake country. WHAT TO BRING: (1) A backpack with plenty of water and snacks. (2) Boots or sturdy closed-toe shoes with good grip. (3) Layered clothes that you don't mind getting dirty. (4) Protection from the elements (sun, wind, fog, rain). (5) Also recommended: Hiking sticks, bug repellent, binoculars, a camera. MEETING PLACE: Meet your guide in the parking lot at Lynch Canyon. WEATHER PLAN: Rain will cancel. Call your guide (see below) if the weather is uncertain. REGISTRATION: RSVP appreciated to Marion Kastner at mewoodbury@live.com or 603-801-1210. Saturday, Feb. 7, 2015: HIKE FOR EXERCISE AND THE VIEWS, Rockville Trails Preserve, 9 a.m. to 1 p.m. Hike through beautiful California oaks on this winter morning with Solano Land Trust volunteer Jim Hanser. Get some exercise on the hills, appreciate great views of the surrounding valleys, and listen to the music of the birds and squirrels. WHAT TO BE PREPARED FOR: (1) Arrive on time and be prepared to immediately carpool from the meeting place to the trailhead. (2) A 4-6 mile hike at a moderate pace. All ages are welcome, but you must be prepared to hike at this pace on rough, rocky, uneven ground. The route includes rugged, steep, and slippery hills that may be full of sticky seeds and thorny plants. Some travel may be off-trail. (3) The preserve is a working ranch where free-range cattle roam as they please. (4) Visitors must be accompanied by a docent at all times. (5) Since the preserve is otherwise closed, the entry and exit gate will be locked except for the start and end times of the hike. (6) There is no drinking water. (7) There are no bathrooms. (8) In order to protect wildlife, cattle, and rare plants—and for your pet's safety—dogs are not allowed. (9) Take only pictures, leave only footprints. (10) Maintain a safe distance from cattle and wildlife, and be aware that this is tick, rattlesnake, mountain lion, and wild pig country. WHAT TO BRING: (1) A backpack with plenty of water and snacks. (2) Hiking boots or sturdy closed-toe shoes with good grip. (3) Long, sturdy pants are recommended, along with layered clothes, and protection from sun, wind and fog. (4) You may also want to bring gaiters (to protect your legs from thorny plants), hiking sticks, bug repellent, binoculars and a camera. REGISTRATION: RSVP appreciated online at conta.cc/1w2I0I8. For questions, call Jim at 707-372-6090. Feb. 14, 2015: VALENTINE'S DAY BIRDWATCHING HIKE / SF BAY FLYWAY FESTIVAL, Lynch Canyon, 10 a.m. to 2 p.m.
Love is in the skies! 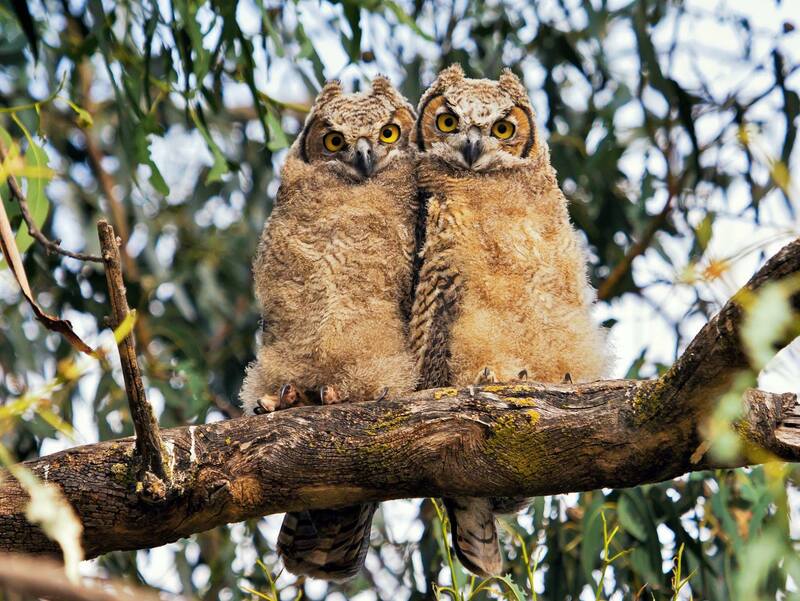 Join Solano Land Trust volunteers for a Valentine's Day hiking tour featuring resident and over-wintering birds, especially birds of prey. The birds can get romantic this time of year. Resident species are preparing for nesting season, and winged winter visitors are anxious to be on their way back north to their breeding grounds. Previous sightings include golden eagles, bald eagles, rough-legged hawks, Cooper's hawks, sharp-shinned hawks, ferruginous hawks, peregrine falcons, prairie falcons and other more common birds of prey and migratory songbirds. This hike is offered as part of the 19th annual San Francisco Bay Flyway Festival. COST: The hike is free. Parking is $5 per vehicle. WHAT TO BE PREPARED FOR: (1) All ages are welcome but they must be prepared for a slow-to-moderate pace covering about 4 miles. The route includes rugged, steep, and slippery hills that are full of sticky seeds and thorny plants. Expect rough, rocky, uneven ground. (2) This is a working ranch where free-range cattle roam as they please. (3) There is no drinking water. (4) There is one bathroom, located in the parking lot. (5) In order to protect wildlife, cattle, and rare plants—and for your pet's safety—dogs are not allowed. (6) Take only pictures, leave only footprints. (7) Maintain a safe distance from cattle and wildlife, and be aware that this is tick, mountain lion, and potentially rattlesnake country. WHAT TO BRING: (1) Cash for parking ($5) and optional donation. (2) A backpack with plenty of water and snacks. (3) Boots or sturdy closed-toe shoes that grip well. (4) Long, sturdy pants and layered clothes that you don't mind getting dirty. (5) Protection from the elements (sun, wind, fog, rain). (6) Also recommended: Hiking sticks, bug repellent, binoculars, a camera. MEETING PLACE: Click here for directions to Lynch Canyon. Meet your guides in the parking lot before 10am. WEATHER PLAN: Extreme weather cancels (e.g., heavy rain). Call Mary Beth Crittendon at (707) 685-5908 if the weather is uncertain. REGISTRATION. An RSVP is requested (not required) to Mary Beth at mbcrittendon@comcast.net or (707) 685-5908. Help take care of Lynch Canyon's 1,000 plus acres. Projects include improving trails, fixing fences, weeding, and the like. WHAT TO BE PREPARED FOR: (1) Ages 12 and up are welcome—under 18 must be accompanied by an adult. (2) When you arrive, ask the leader for a free parking pass. (3) Tools are provided. WHAT TO BRING: (1) A backpack with plenty of water and snacks. (2) Heavy work gloves. (3) Eye protection (e.g., sunglasses). (4) Boots or sturdy closed-toe shoes with tread for rough, steep, and slippery terrain. (5) Long, sturdy pants and layered clothes that you don't mind getting dirty. (6) Protection from the elements (sun, wind, fog). (7) Optional: bug repellent. RSVP to Ken Poerner at ken@solanolandtrust.org or 707-580-6277 so he can bring enough tools. DIRECTIONS. Meet in the Lynch Canyon parking lot.